One thing that I’ve found out over the past year is that all of these officials (baseball, basketball, softball, football, volleyball, soccer, etc.) have their favorite sport to officiate. For Rich, its baseball…that’s his passion. Rich works at least five nights a week during the baseball season. That’s leaving work early, driving at least an hour to the game, dressing in slacks (and half the time with hot protective equipment on) in hot and humid Iowa weather, then driving home at least an hour, getting home around 11, going to bed then getting up six hours later and starting all over again. That’s passion. He LOVES BASEBALL. For that dedication, hard work and being an exceptional umpire he’s been awarded games to work at the State Tournament, a well-deserved honor. Before Rich’s sub-state game. Rich is far right, Jeff is at the center. Sharing a light moment before the game. Most officials will tell you that they’re either officiating the sport that they love, or waiting until that season begins. Until then they’re officiating another sport to kill time and make a little money. That’s the case with me. I love basketball. I like baseball. I’m trying volleyball this fall. The rules book just arrived, a bookworm I’m not. The exam is less than a month away. I know very little about the sport. Wish me luck. 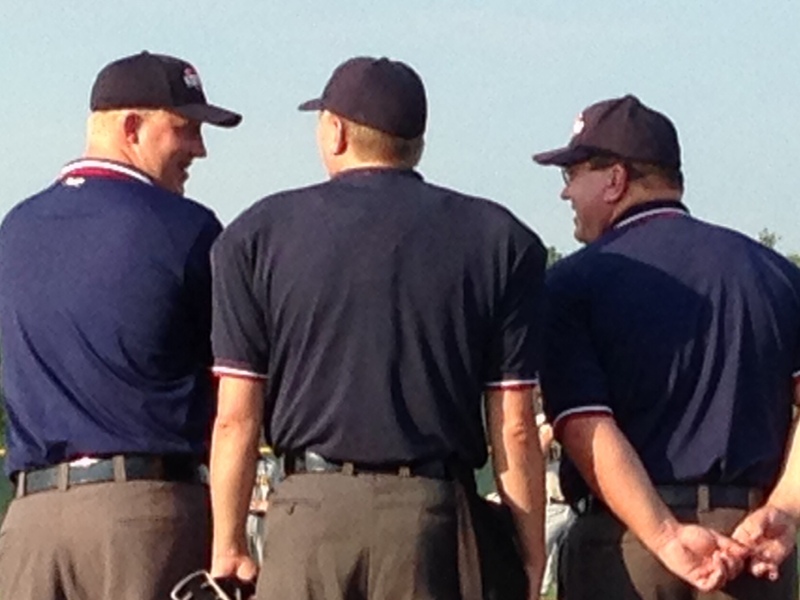 Here are the last of this past seasons “amusing” stories from the baseball games and basketball games that I officiated. While I worked as base umpire during a sophomore game the shortstop ran to the outfield and made a remarkable diving catch, lying flat-out to catch it…he slide several feet on his belly after hitting the ground hard. I called the batter out on the catch, as the kid just laid there. His coach came out of the dugout, concerned that his player was injured. I looked at the kid, and his teammates around him. His teammates were laughing, the player curled up into the fetal position and I turned to his coach, who was requesting permission to come onto the field, and replied “where he’s hurt coach, you can’t help him” to which the coach stopped and said “oh…he got hurt there…oh…”. (His protective cup “bit” into the area that its intended to protect) The game resumed after a few moments. During the 3 on 3 basketball league that I worked this summer, between two eight year old squads. These players are just getting onto the court for the first time to play competitive ball. They’re skinny little whips racing around the half-court. The games are usually half wrestling match, half track meet. Final scores are usually 6-4…that’s five made baskets in eighteen minutes. Its a mess to officiate but amusing to watch as these little ones try out the moves that they’ve been practicing at home in the driveway. One little guy got the ball (mind you he was about twenty-five feet from the basket, so he wasn’t a scoring threat…no one is at that level) and he proceeded to dribble the ball between his legs in a figure-eight as his hands and arms flailed about in dizzying fashion ala Harlem Globetrotters style. His defender could have reached in at any time and knocked the ball away but didn’t because he was either too mesmerized by this display of dribbling or just respectful of a “guy doing something cool” and didn’t want to interrupt it. At the same summer league one parent, whom I know well, was teasing me before the game telling the players “Hey…watch out for this ref…he’s blind as Mister Magoo! !” The kid stopped and looked at us and asked “Who’s Mister Magoo?” I aged a little right then. One of the last nights that I worked the 3 on 3 league I was assigned the “old gym”. Old gyms just have a smell to them. Musty thick air boxed in by bleachers that put the fans right on top of you. As I changed into my game shoes I spied a little girls game warming up, maybe nine-year olds. They were lined up at the free-throw line, taking turns shooting as someone’s little sister (decked out in a black and white stripped outfit and pink tutu) pranced and twirled around them in a circle, obvious that this was a basketball court and not a stage. A mother walked by carrying a cake for after the game, someone had a birthday that night. The kids chattered excitedly. I don’t know if they were more excited about the game, or the cake…either way…it was a good night to be on their team. And lastly…the varsity crew that had asked me to join them this upcoming season has….elected to use the guy that had moved away. Instead of me working 21+ varsity dates with them…I’ll get half of that. Games that I looked forward to working are now his. Games that I told folks that I couldn’t work since I was now with this crew are….gone to other officials. I told folks that I was now on a varsity crew of three. Turns out they’re loyal to the guy that moved away and wish to keep him “in the fold” even though he’s moved away. Now I feel like a horse’s rear-end. Like the kid who gets picked last for the team. I don’t blame them for being loyal to him, good officials are hard to find. I blame myself for not being more thorough in asking questions of the crew chief and in what I should expect in the way of games prior to accepting. There are now gaps in my season where no games are assigned to me. I’ll get games, eventually, probably as a fill-in for someone who is sick, injured or has a work commitment come up, but this is what I wanted to avoid…and I failed at that. God’s always got a plan, if even for something as trivial as officiating games. It’ll work out. I’ll dazzle the crews that I’m subbing on and, God-willing, I’ll get asked to join a crew fulltime next summer. My goal of getting post-season games is still on the table…with or without that crew. YOU’RE AS BLIND AS MISTER MAGOO!!! Don’t worry, Rich. I’m planning to have a heart attack real soon. You can work some games for me!